Tired of arguing about which way to go? Sick of asking strangers for directions? 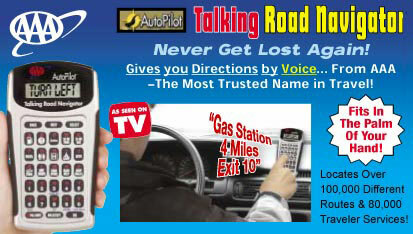 What you need in your car is the AUTO PILOT – the TALKING Road Navigator bearing the most trusted name in travel "AAA"! Now you'll not only plan your trip with Auto Pilot, but you'll actually HEAR clear directions along the way to help you get to your destination faster and safer! Auto Pilot is as easy to use as a handheld calculator and it even can find driver services like food by category (pizza, burgers) or brand (McDonald's). Now your entire family can travel with confidence and have more fun along the way! Never Get Lost Again! HEAR PRECISE POINT- TO- POINT DRIVING DIRECTIONS BY VOICE Customized To Your Trip Virtually Anywhere In The USA! Fits in the palm of your hand! Tells you miles & minutes your trip will take … all by “voice” to simplify use and minimize driver distraction Nationwide City- To- City Directions! Best Route, Distance & Driving Times Point- To- Point, Local & Nationwide! 80,000 Instant Locations! Nearest Gas, Food, Hotels & Motels, Campsites, Rest Areas, Tourist Attractions, AAA Offices Shopping & More! Emergency Services! 24- Hour Roadside Assistance, 24- Hour Gas Stations, Hospitals & More! FAST ‘N EASY TO USE! Type current location (State & City). Type destination ( State & City). AUTO PILOT instantly TELLS YOU distance, time & directions between major cities.